SpeechTechie- Technology, Apps and Lessons for SLPs and Teachers who like Words: 3rd Birthday and New FIVES Booklet! SpeechTechie is 3 years old today! I am always amazed that this blog I started kind of on a whim has changed my life so much. Thank you all for sticking with me! I was telling my other half that my blogoversary was coming up and asked, "How long do you think it has been?" The answer I received: "10 years." LOL! To celebrate, today I am releasing an update on my original FIVES Criteria booklet. 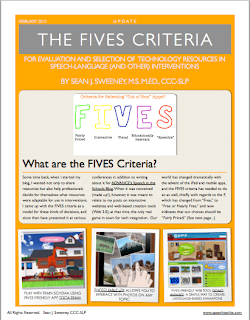 The FIVES criteria, a model evaluating technology for use in interventions, is one of the central themes of this blog and the presentations I have made. It is meant as a filtering tool for all professionals working in special education, in order to look at all of the wonderful resources available to us and decide if they could provide contexts for intervention according to the criteria of Fairly Priced, Interactive, Visual, Educationally Relevant, and Speechie (hence, FIVES). This model has changed with our shift from web platforms to mobile apps, and the new booklet describes how to look critically and reasonably at "Fairly Priced" and make your own decisions. There are also new examples for the I, V, E, and S. I am really excited to share it, as I have been working on it for a few months! There are two ways to access the booklet. Particularly if you are on an iPad, you may want to use the Dropbox link (no Dropbox sign-in needed). -The document will be saved to your iBooks and you can zoom in and read all you like. You should also be able to download and print from that link, or, if you have trouble, it is embedded below. You can also click through and download/print from Scribd on a laptop or desktop. Email subscribers- please click through from your email to the post for this. This post about FIVES booklet is such a great resource, especially for those of us in schools working to navigate the technology world on a limited budget. Congrats on hitting the 3 year mark! !